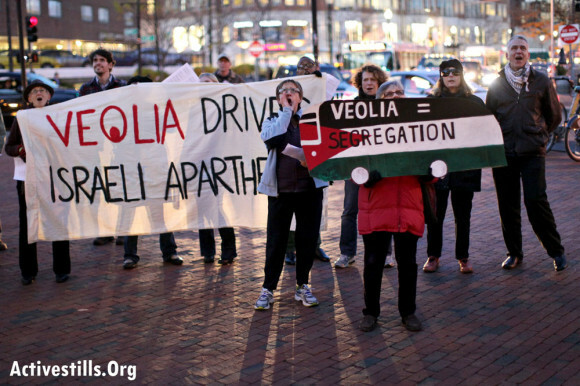 Over the last two and a half years, supporters of Palestinian rights in Boston have mounted a BDS campaign aimed at denying a new contract to run the Massachusetts commuter rail to Veolia, one of three companies that formed the Massachusetts Bay Commuter Railroad (MBCR). With a 60 percent stake in the MBCR, Veolia has been in charge of operating and maintaining the trains since 2003. On January 8, they tasted victory, when a contract that could be worth as much as $4.26 billion was awarded to the MBCR’s sole competitor, Keolis America, by a vote of the joint Board for the Massachusetts Bay Transportation Authority (MBTA) and Massachusetts Department of Transportation (MassDOT). During the public comment period before the Board vote, members of the groups that came together in a ‘Derail Veolia’ coalition urged the Board to be “on the right side of history,” and deny a new contract to a company that is complicit in human rights violations in the occupied West Bank and that is the target of an increasingly powerful international and national campaign. They also highlighted Veolia’s attacks on labor and a range of other practices that do not serve the public, including its role as the world’s leading water privatizer. They further pointed out evidence of the MBCR’s poor performance over the past decade, including its record of late arrivals, chronic delays, cancellations and dark, cold coaches, a declining ridership, OSHA fines for ‘serious health and safety offenses,’ cases of double-billing, and tens of millions of dollars of additional costs to the Massachusetts taxpayers that were not in the original contract. A representative from Veolia who addressed the Board denounced the BDS campaign. The MBCR urged the Board to delay its decision-making for at least a month, and give it the opportunity to discuss its proposal for a new contract in greater depth. But this was not to be. The MBTA/MassDot Board decided to act immediately on a recommendation of the General Manager of the MBTA that the contract be awarded to Keolis for offering a superior proposal in terms of pricing, operations and maintenance plans. The vote to do so was unanimous. The Jewish Community Relations Council immediately claimed the vote had nothing to do with Veolia’s work in Israel or the BDS campaign.